Strength training is one of the most important exercises women should do! Benefits include stronger bones and heart, improved balance, easier weight loss and maintenance, and improved mood and sleep. It is designed to improve muscular fitness by exercising a specific muscle or muscle group against external resistance, including free-weights, weight machines, or even your own body weight. Women do not have the hormones (specifically testosterone) to build enough muscle to get “bulky.” The women that you see with big (and in my opinion amazing) muscles work really hard to get that way by working out consistently, supplementing, and eating A LOT. They do this for years to build muscle, it doesn’t happen in a week. Myth #2: Only cardio is good for weight loss. False again. When you lift weights you are breaking down muscle, then your body works to repair and build that muscle for 24-48 hours after your workout. During this time your metabolism is boosted and your body burns more calories. Plus muscle burns more calories at rest than fat does. 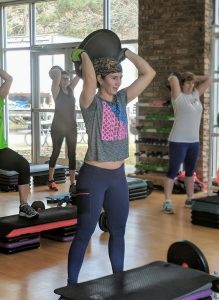 So how does one start strength training? Begin with identifying which style works for you, or choose a combination of styles. Body weight training. This is great if you are traveling or have limited equipment. The downside is that you will have to continually modify the difficulty to ensure you are progressing. Examples include; push-ups, sit-ups, pull-ups, dips, lunges, and air squats. Machines. This is a good place to start if you have never done strength training before. It’s easy to follow the pictures on the machines and adjust the weights. The hardest part of using the machines is usually figuring out how to adjust the seat height. Examples include leg press, tricep pulldowns, cable rows, leg extension, and seated leg curls. Dumbbells. I usually start my clients out using dumbbells because you can start with a small amount of weight and progress up slowly. Dumbbells are also good at stabilization and correcting imbalances in the body. Examples include dumbbell row, push press, bicep curls, tricep kickbacks, chest press, lunges, and squats. Barbells. My personal favorite is the barbell. Once you progress from the dumbbells to the barbell you will notice that you can lift much heavier with a barbell because it is more stable. However, please make sure you have good form before starting barbell movements. Always start with light weight to ensure proper form before moving on to heavier weights. Examples include back squat, bench press, deadlift, and the clean and jerk. Sometimes it can be difficult to find pre-made work outs that fit your exercise level and work around your limitations. This, by no means, is a “one size fits all” form of exercise. Making minor modifications can allow you to do exercises without the strain and the worry of injury. If you need help see one of our Wellness Coaches. The Y also offers 1-on-1 Personal Training with our qualified trainers or Boot Camp for a group setting. Both are a great way to get into strength training is a safe and supportive setting.